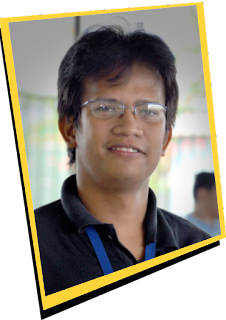 Kwento Ni Toto shares what's something new with Max's Restaurant. As always, they're having innovations with the menus that they're serving to us. So without any more blubbering and storytelling here's what's new to their list of menu. 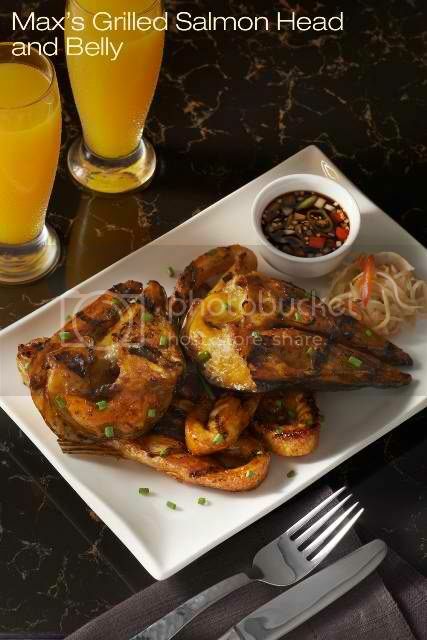 A significant part of tradition, Max’s Restaurant has brought authentic Filipino cuisine to the forefront. It has established the presence of heirloom dishes like its “sarap-to-the-bones” Fried Chicken, Kare-Kare, Sinigang, Crispy Pata and Pancit Canton in almost every Filipino celebration. After almost 7 decades, this homegrown brand is not resting on its laurels as it continues to create innovative ways to step up the Filipino’s dining experience to a whole new level. This time, Max’s redefines elegance in dining with its new epicurean spread. 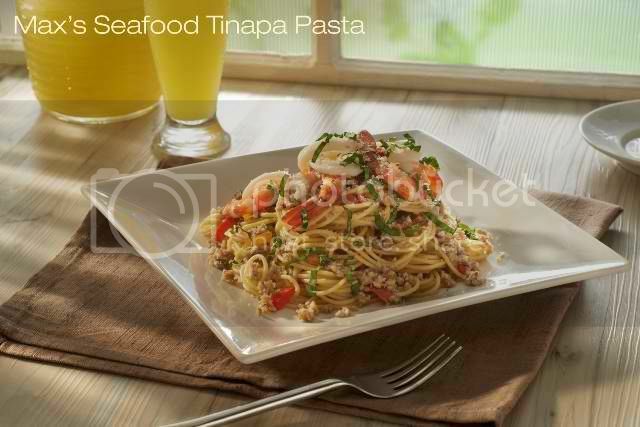 Seafood Tinapa Pasta – Spaghetti enthusiasts have a new dish to rave about with Max’s flavorful take on seafood pasta. This delicious recipe highlights smoked bangus complemented by other sea favorites like shrimps and squid, then sautéed in extra virgin olive oil, garlic, onions, red and green bell peppers, fresh tomatoes and chopped siling labuyo, and sprinkled with grated Parmesan cheese and thinly sliced fresh basil leaves. A must-try for those who like their pasta hot and spicy. 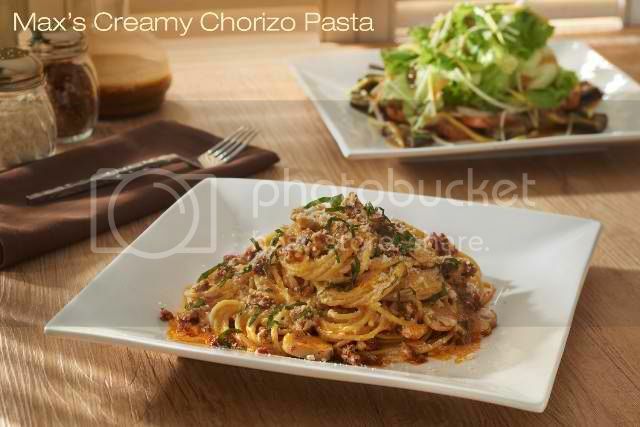 Creamy Chorizo Pasta –Max’s gives an innovative and creamy twist to the Filipino’s favorite pasta. The good, old-fashioned spaghetti recipe is given a delightful kick with Max’s creamy sauce of Spanish chorizo sautéed in extra virgin olive oil, garlic, onions and fresh eggs. This dish is made even more sumptuous with Parmesan cheese and thinly sliced fresh basil leaves. 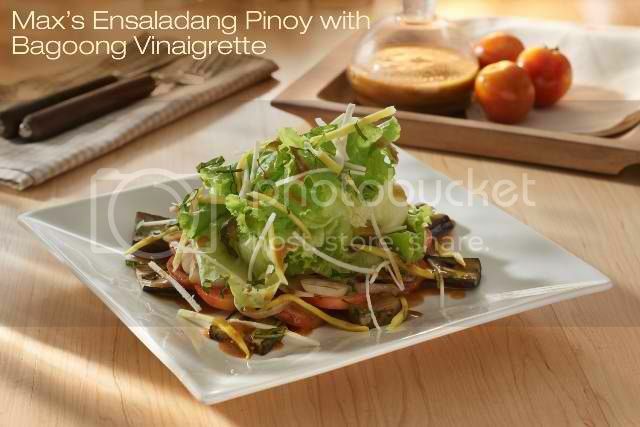 Ensaladang Pinoy with Bagoong Vinaigrette – An appetizing ingredient to your regular green said, fresh eggplants are grilled perfectly for that smoky flavor and tossed with ripe tomatoes, onions, lettuce, julienned green mangoes, singkamas and basil leaves, then drizzled with sweet and tangy bagoong vinaigrette. Tamarind Spiced Sweet Potato Chips – Sure to whet the appetite is Max’s deep-fried yellow kamote chips seasoned with savory tamarind spices. Grilled Salmon Head and Belly – Indulge in the freshest catch from the sea with Max’s perfectly grilled salmon head and belly immersed in traditional inasal marinade and served with soy vinegar dipping sauce with a zest of atchara. 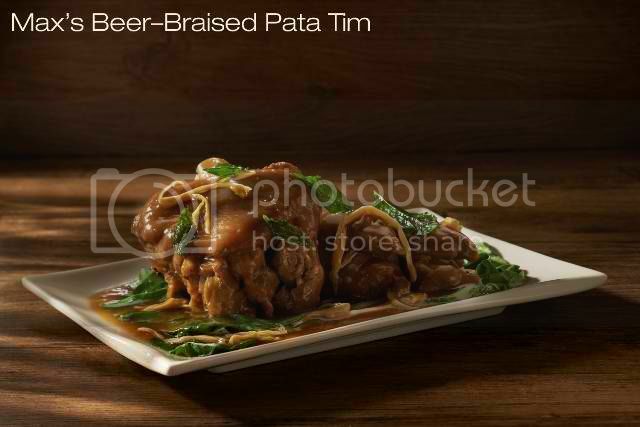 Beer–Braised Pata Tim – Mildly sweet flavor of slow-cooked pork pata marinated in savory beer, soy-based sauce, special spices and dried banana blossoms is a delectable adventure for the palate. Served on a bed of blanched native pechay and garnished with fried basil leaves, this new dish from Max’s is a sure hit! 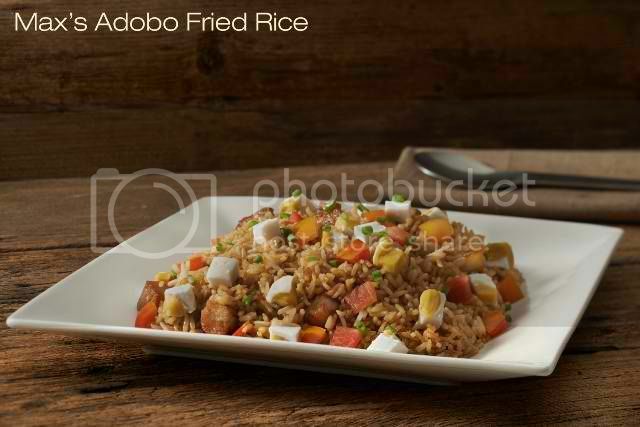 Adobo Fried Rice – Max’s punches up the Filipino’s staple food with pan-fried pork belly sautéed with garlic and seasoned with adobo sauce. Satisfying and delicious on its own, this dish is also topped with diced salted eggs, fresh tomatoes, and sprinkled with chopped spring onions. Max’s new line of dishes adds a touch of elegance to any intimate dinner affair. As Chef Laudico puts it, "Dinner has a unique kind of charm compared to any other meal of the day. It's when we explore palatable flavors while unforgettable moments unfold. With Max’s Dinner Specials, we created an exquisite experience for diners, using only fresh ingredients and incorporating traditional methods of food preparation. With these dishes, we want Filipinos to share delightful meals with their friends and loved ones, and re-discover why dishes are not only delectable, but unforgettable as well,”.” shared Chef Laudico. Drop by selected Max’s Restaurants from 6:00 pm onwards starting October 15, 2013 to indulge in Max’s Dinner Specials, Max’s premium dinner feasts that are perfect for friends and families dining together. 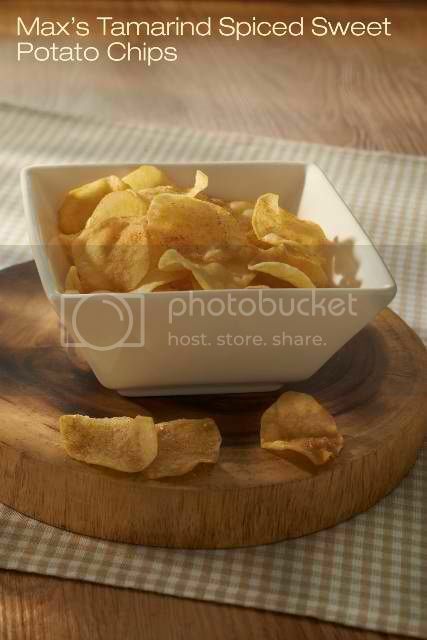 Check out the latest gastronomic news from the most loved Filipino brand. Visit www.maxschicken.com, the official website of Max’s Restaurant, and www.facebook.com/maxsrestaurant to be a member of Max’s Facebook Fan Page.